So if we look at the figures above this means that we should be paying Capita £36.56 million assuming they deliver all of the guaranteed savings. It may therefore surprise you that in the year 1 July 2013 to 30 June 2014 Barnet paid Capita £75,008,840.49. Yes £75 MILLION, £38.44 million more than we should be paying. Even setting aside the £16 million of up front investment Barnet have paid to Capita (which should be factored back into the annual cost savings) that still means we paid £59 million when the cost of providing the service before outsourcing was only £53 million. Also bear in mind that Barnet have shelled out millions in redundancy payment, £8 million on Agilisys/iMpower, millions for agency staff as well as causing distress and heartbreak to hundreds of families that have suffered redundancy to push through these contracts. At tomorrow night's Council meeting, Richard Cornelius will once again be selling the myth that Capita are saving Barnet residents a fortune in his response to a question from Alison Moore. I hope some of the Councillors present start asking whether these figures are real or just smoke and mirrors. The number don't add up Cllr Cornelius. Over the years Barnet Council have produced some highly suspect and biased reports to support their political ideology of outsourcing the entire council. The One Barnet Business Case reports are the most obvious examples and I blogged about the DSG report back in March 2011. In that business case there was a lack of evidence to support many of the assumptions and a series of what I can only describe as entirely untruthful statements about investment and who was going to make it. At that time they said that all of the investment was going to be made by the outsourcing company and the only exception would be the cremators at Hendon Crematorium. Roll on two years and Barnet Council sign a cheque for investment for £16.1 million for all of the investment. With the election out of the way, the council zealots now have another four years to push through their commissioning council agenda, one dictated entirely by political dogma and lacking in both financial rigour and common sense. Tonight we see yet another of these fallacious reports which is supposed to dupe any stupid, ignorant, lazy or unquestioning councillors on the committee. Luckily, I think (hope) that today we have some rather sharper councillors who aren't going to put up with this utter tripe and who are going to ask some probing and challenging questions. I have read an excellent report by Dexter Whitfield which sets out those deficiencies concisely and I would urge as many people as possible to read it here. However, I believe that the report will not be allowed to be taken at the meeting nor are the unions who represent the staff that will be impacted by the decision allowed to speak. Barnet Council don't believe is balance, in evidence or in alternative view points so any report which seeks to challenge the Council's view point must be suppressed. This means that council officers employed by Capita are promoting another outsourcing project of whom the most likely winner will be Capita. No conflict there then. "The in house option is the representation of the service continuing to operate broadly as now, but on the basis that budgets are to be reduced significantly. This option would therefore require significant service reductions to meet budget targets."... "The in house model cannot meet all the objectives for this service, as the level of service cannot be preserved and it would not actively involve schools in the development process." Less ability and freedom to innovate - an entirely groundless and unsubstantiated assumption based on a prejudiced view of "public bad private good"
Delivering savings will limit the capacity to generate income - again an entirely unsubstantiated and false statement. The in-house team have already had to cope with budget cuts every year for the last four years and at the same time generate £9.1 million of income per annum. Cannot secure additional private funding - so what happened to Invest-to-Save? No sharing of risk with schools or third party - who says the schools can't share some of the risk? 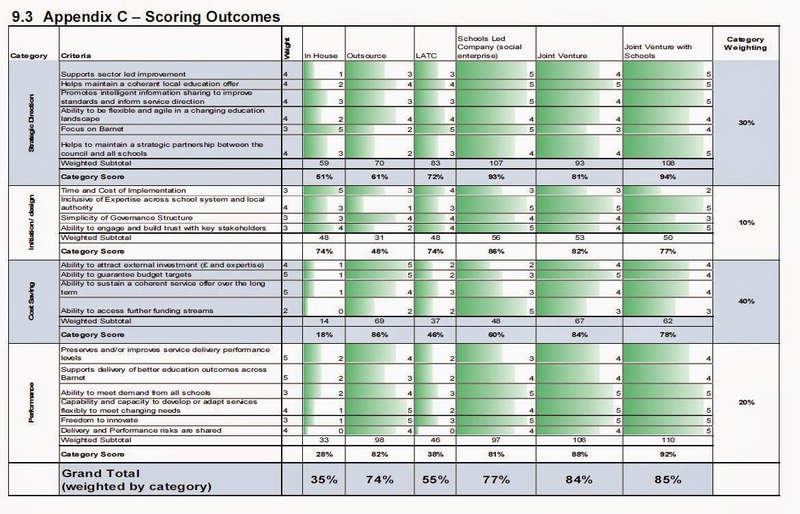 The council have also fiddled the option evaluation scoring scheme so as to load it against the in-house option. No one is answerable for the scores given, and as far as I can see they are entirely made up and without substantiation, simply a personal view of the officers involved. Strategic direction is given 30% of the marks whereas performance - what they actually deliver -get only 20% of the marks. This illustrates perfectly how dogma trumps how the service is actually delivered and why the officers are completely out of touch with reality. Don't let anyone believe that just because there are lots of numbers it is a scientific or rational mechanism. It isn't. 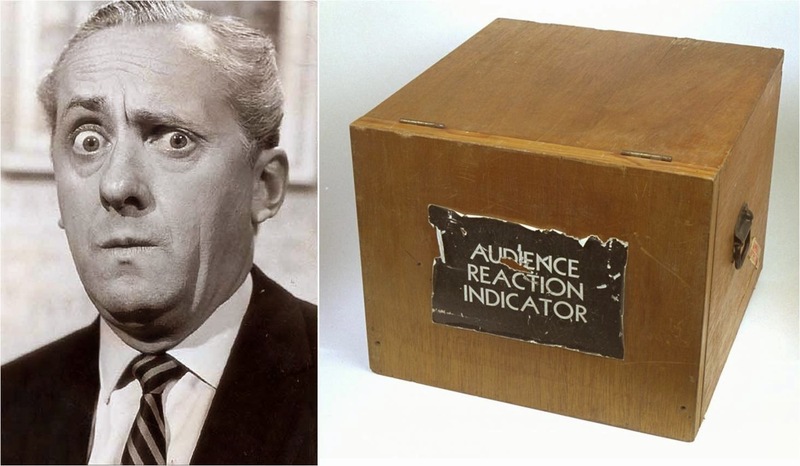 I would liken it to Hughie Green's Clap-o-Meter - unscientific, driven entirely by the amount of noise made by the audience and for amusement only. (Any resemblance between Hughie Green and Richard Cornelius is entirely coincidental). I hope that at the meeting tonight the Labour Councillors make plenty of noise, and ensure this report is consigned to the rejects bin where it belongs. Capita billed £675,137.58 the majority of which related to the CSG contract. Discovering specifically what it is for shall have to wait until the inspection of accounts next year and even then I don't hold out much hope of getting any real detail on the figures. NSL billed £561,943.35 which looks like two payments instead of one. Facultatieve Technologies Ltd who have been installing new Cremators at Hendon billed £185,288. Apologies to readers for my prolonged absence from blogging but I will pull my finger out and get back into the swing of things now the summer holidays are over.